Just only a couple of days ago, the country had the pleasure of witnessing one of the biggest and most iconic outcomes to ever come out of the sport of baseball. The Chicago Cubs had finally won the World Series after 108 years. With social media blowing up on all ends throughout the entire classic game seven, there seemed to be no reason why you couldn’t say that this was one of the happiest moments in sports history. However, the win also came with a price. The price of women and domestic violence. 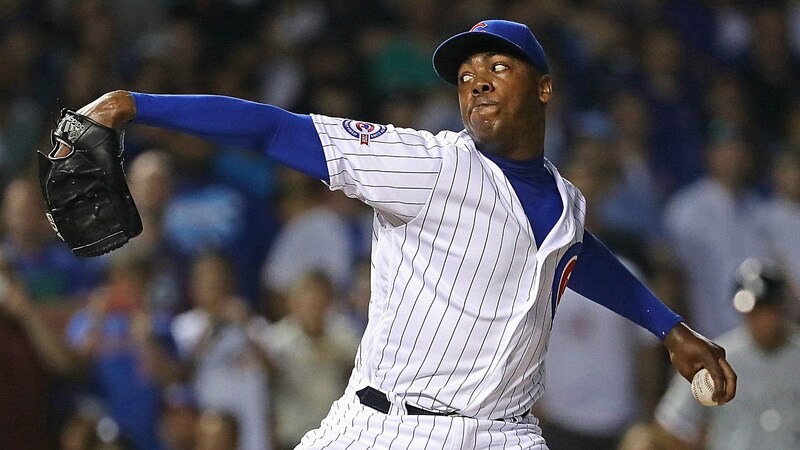 One of the biggest reasons why the Cubs got to where they are now was, the acquisition of flamethrower Aroldis Chapman from the Yankees back in July. While he does amaze people with his ability to throw the ball at record speeds of 104-105 miles per hour, what people don’t understand is, he is a world champion and a criminal. Back in October of 2015 while he was still on the Cincinnati Reds, Chapman was said to have fired eight gunshots in his Miami home and almost strangled his girlfriend to death after a heated argument, which resulted in the police showing up to his home the night before Halloween. After hearing from both sides of the story however, Chapman was let off of all allegations, and was able to go about his duties without going to jail. Shamefully, the only discipline that Chapman received was, a thirty game suspension in the 2016 MLB season while on the Yankees. How’s that for justice. What’s even more sickening than what he did and the fact that he got off scot-free is, seeing him smile and celebrate on T.V. after the Cubs were an out away from breaking their curse. It makes you wonder, is justice really happening when a guy who basically almost killed a woman is being celebrated for closing out so many games for a baseball team? Is justice really being met when someone who has clearly admitted to a crime is still being allowed to produce at the professional level, just because he has a fantastic talent and will bring people to the ballpark? It would be hard to argue that it is justice. This isn’t the first time that professional athletes have had a controversial lienant suspension and disciplinary action. In the NFL, Ray Rice only got a two game suspension for beating his wife in an elevator, which was also caught on camera. He was also never arrested. The same event happened with Cowboys defensive end, Greg Hardy. Not only was Hardy accused for domestic violence, but when he did come back to the NFL he still made creepy comments, saying controversial statements about Tom Brady’s wife. It just amazes me how these people think that they have so much power because of how much money they make. It’s becoming more and more apparent that the four major professional sports are becoming somewhat sexist. In these types of businesses, money and power will always trump the law. And then people wonder why some women just stop watching sports. It’s becoming a corrupt business. I guess the only justice that I can get out of the Chapman situation is, the beauty of seeing him blow a three run lead in the eighth inning when giving up a home run to Rajai Davis, and not being able to get the last out for the championship. As sad as that sounds, it is definitely true. I’m happy for the Cubs and their fans, because I’ve been through that as a Red Sox fan in 2004, but there is truly a cost. The most disgusting thing about all this is, Chapman celebrated the win with the person who he abused. While it seems that she has moved on, the thought cannot go away. It’s almost as if he is blessed that this world series happened, because now people won’t shine the spotlight on him, but rather on the historical win. So as Cubs fans will celebrate their beloved team for days and weeks and months, hopefully people everywhere else will realize the flaws in the way we run society today, especially with professional athletes. I'm a movie lover, and a longtime sports fanatic. I love to talk and write about anything sports.